Salad is a popular ready-to-eat dish often containing leafy vegetables, usually served chilled or at a moderate temperature and often served with a sauce or dressing. Salads may also contain ingredients such as fruit, grain, meat, seafood and sweets. 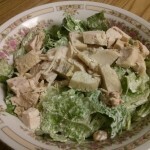 Though many salads use raw ingredients, some use cooked ingredients. Hope you enjoy the following Salad recipes. 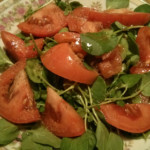 Watercress & Tomato Salad is dish that my grandmother used to always serve us when we were kids. She called it “Berro” in Spanish, said that it was good for us & to eat it all. 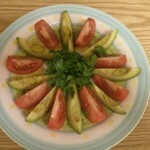 It IS an extremely healthy popular green salad that drizzled with some extra virgin olive oil & vinegar is delicious! 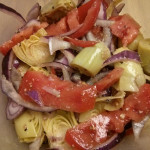 This Artichoke, Red Onion and Tomato Salad recipe is very healthy, combines a good balance of flavors and extremely simple to make. 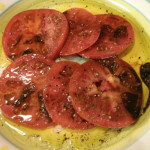 This Sliced Tomato Salad celebrates the tomato and all of it’s deliciousness. Makes a wonderful starter or side to any meal. Rotisserie Chicken Caesar Salad is a delicious alternative to the already delicious Classic Caesar and makes for a satisfying lunch or light dinner. For this recipe, we used rotisserie, but you could just as easily substitute baked, grilled or fried chicken. 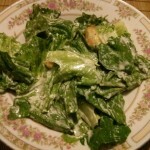 The Classic Caesar Salad is said to have originated at Caesar’s Restaurant in Tijuana in 1924. It will continue to be a favorite at our table for many years to come! This simple and delicious Tomato and Avocado Salad is made with ripe tomatoes, avocado, cilantro, lime juice, olive oil, salt and pepper. One of my favorite salads and goes well with soooo many meals. 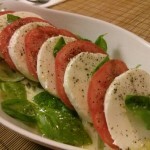 This light and fresh Caprese Salad recipe is the perfect quick and easy accompaniment to any summer meal. 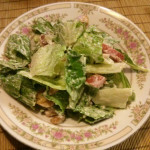 The BLT Caesar Salad is a twist on the classic and already great Caesar. Bacon makes everything better!